Why choose corporate housing over extended stay hotels? Business travelers may have a routine already, book the flight and check into an extended stay hotel. Then there are those who prefer corporate housing. Corporate housing is an industry which is based on renting out vacant apartments, houses, lofts, and condos when the unit owners listing them are either landlords, property managers, or individual owners who do not occupy the suites often enough. When it comes to cost, corporate housing comes up to about 20% less than extended stay hotels. Since it is catered for professionals, there usually are more locations available in urban downtown areas. Whereas a hotel bill is subject to taxes, renters who stay more than a month in corporate housing are not taxed on rent. Corporate housing is extremely flexible. Contrasting extended stay hotels, they are more comfortable when traveling with kids or pets. Special requests like playpens and highchairs can be met. Usually a washer and dryer duo are in the unit, unlike at extended stay hotels. In condos where the corporate housing is located, there usually is access to the amenities in the building. Some have rooftop pools, fitness facilities and probably outdoor patios. Ask the Human Resources department in your company about corporate housing. They are usually the ones who can make the accommodations. Habitually, in these cases, your company partners with certain hotels or other lodge alternatives to provide you housing while away. 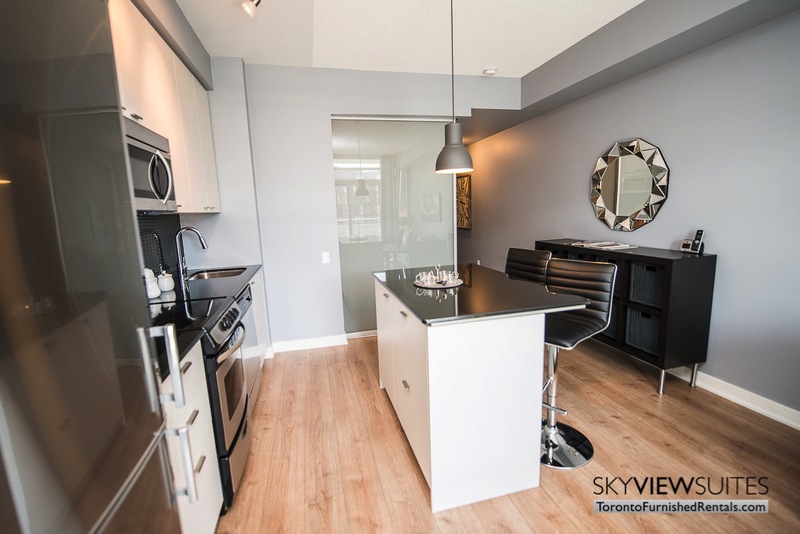 For corporate housing in Toronto, go to SkyViewSuites www.torontofurnishedrentals.com to see our furnished apartments.